Leuser – far right in distance; Loser – near right; Tanpa Nama – centre. 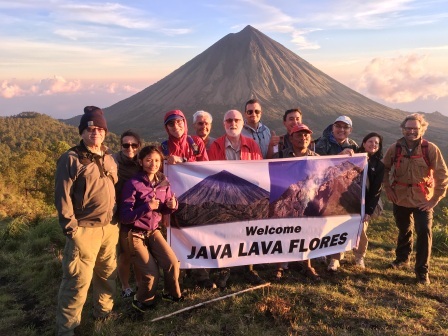 Java Lava trekked Gunung Leuser in Sept 2010 and Aug 2014. A detailed description is on the Gunung Bagging website. The Leuser Range lies in the western section of the Gunung Leuser National Park, Aceh. The region is the largest wilderness area in South-East Asia and devoid of all human habitation. It is non-volcanic – of ancient geological origin, some 300 million years old. 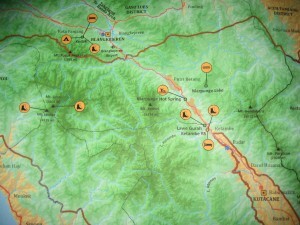 The highest peaks on the range are Gunungs ‘Tanpa Nama’ (3,466 m), Loser (3,404 m) and Leuser (3,119 m). Gunung ‘Tanpa Nama’ means mountain ‘without a name’, so-called in the absence of a name having been formally attributed to the peak. 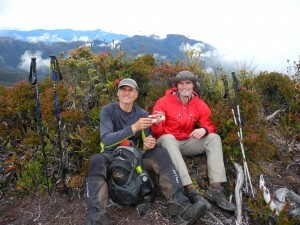 ‘Tanpa Nama’ is the second highest point in Sumatra after Gunung Kerinci (3,805 m). It lies inland from the escarpment, is easy to climb and offers spectacular views in all directions with five-six ranges of mountains in the distance each with declining hues of blue. Most trekkers set their objectives as Gunungs Loser and Leuser; these peaks rise from the east with precipitous drop-offs on their western faces offering spectacular views over the rugged escarpment towards the west coast of Aceh. 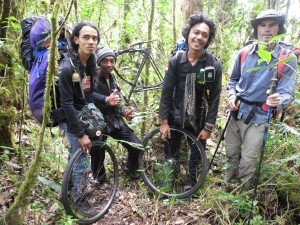 Gunung Loser is the higher and more accessible of the two peaks. 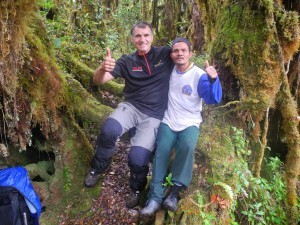 With an experienced guide and sound porters, Leuser is an exhilarating but long and, in some parts, tough trek. 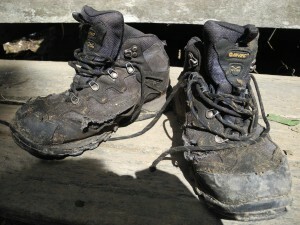 Allow 12 days for the full trek including for bad weather/rest. Pak Rajajalli (Jalli), 0813 6229 1844, Romi Ruanda, 0823 7064 7906, website: pendakianleuser.wordpress.com/, operate treks from the Rain Forest Lodge, Desa Kedah, Kecamatan Kuta Panjang, Kebupaten Blangkejeren. Pak Jalli has extensive knowledge and experience of the region having trekked there since 1981 and is dedicated to its conservation. He will arrange guide/porters, permits/park fees. etc. Travel Medan-Kedah by car takes one long day. Car hire Medan: Ramadhan, 0813 7018 3448, who operates in association with Pak Jalli. 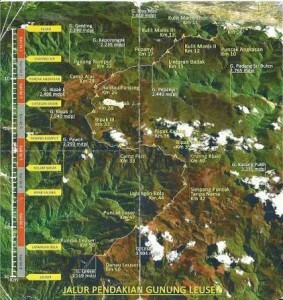 The Gunung Leuser National Park brochure, (Climbing Mount Leuser 3,119 m ASL – in Indonesian), shows the route and camp sites superimposed on an impressive satellite photo of the region. Ask Pak Jalli for the brochure. With a guide, this brochure is adequate. The trek involves five stages corresponding to ridges/valleys traversed. Transferring from one ridge to another often involves steep descents/ascents. The drier periods are February-March and July-August but assume rain at any time. Much of the trek is between 2,400 and 3,000 ms. Temperatures drop to 5-10 C before sunrise but are pleasant during the day. Local weather is fairly predictable: clear skies from late evening till mid-morning; clouds then begin to rise from below often blanketing the region (adiabatic influence); by afternoon drizzle; sometimes heavy showers in late afternoon/evening. Camp sites are numerous but space is often limited; groups should not exceed 3-4 tents; guide/porters have their prefered places. Your guide will decide when and where to set camp depending upon the weather. 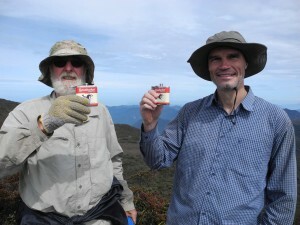 Guide/porters provide a basic diet of rice, mie and dried fish with onions and chilli for breakfast and dinner, and biscuits for lunch – plus tea and coffee. Bring your own supplements – muesli, dried fruits and nuts, freeze dried vegetables, cheese, salami, etc. 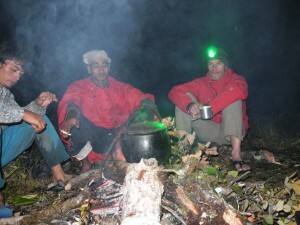 Porters cook over open wood fires that is becoming increasingly scare around some camps. Water is available at most camp sites often in soaks, a hole in the ground. Ensure that you have adequate medical supplies; think through what you would do in the event of an emergency. 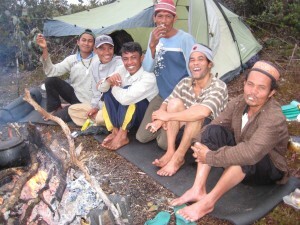 Camp Padang Rumput (2,404 m), about mid-point, has been used as a base for helicopter SAR. Footnote: during our August 2014 trip, Alfred Fahringer, lepidopterist (butterflies/moths), caught a very ancient form of moth that experts have now identified as a species new to science, and have named it Endoclita fahringeri.